Jeremy Corbyn’s brother recently made headlines by tweeting that “#Zionists cant cope with anyone supporting rights for #Palestine”. That the tweet took place in the context of a heated discussion about how the Labour Party is coping with increasing allegations of anti-Semitism is not the point. The point is that the word “Zionist” has become toxic on the British Left, and I have a problem with this. On one of the Sunday morning radio shows, Jonathan Freedland was asked about this. He quoted the Israeli author Amos Oz who said that “Zionist” was like a family name. There always needs to be a first name, such as “Religious Zionist” or “Socialist Zionist”. But Freedland himself, when asked, said he’d rather not use the label “Zionist” to describe his own views as it would just cause confusion. There are really two approaches to dealing with political labels that become toxic. One is to accept reality and abandon them. The other is to be defiant and embrace them. And there are consequences in the real world to choosing one or another of those options. For example, a generation ago, right-wing politicians in America would label every attempt at social reform, no matter how modest, as “socialism”. (They still do, but with less success.) As the Cold War raged, the word “socialist” had become toxic. We on the American Left would argue that by openly calling ourselves “socialists” we were giving breathing space to liberals, and changing the political discourse in the country. Little did we realize that within a few years, an openly socialist politician would be a serious contender for the Presidency. Still, there are terms we’ve been forced to abandon. Most leftists I know don’t call themselves “communists”, for example. While we can all claim to embrace the ideas expounded by Marx in the Communist Manifesto, most of us accept that it would cause more confusion than it’s worth to try to claim the word for ourselves. This is helped by the fact that up until 1918, most socialists called themselves “social democrats”, and that the Bolsheviks took on the rarely-used “communist” label to distinguish the new parties they were creating. It was a label we could discard because we had a perfectly good alternative. But this is not the case with the word Zionist. As Freedland and most others would agree, a Zionist is a person who supports the Jewish people’s right to a national homeland. One could be a Zionist and oppose the current right-wing government in Israel. One could be a Zionist and support an independent Palestinian state, side by the side with Israel. One could oppose the occupation and still be a Zionist. In fact, one could even argue that if you really believe the Jewish people need a state of their own, and want it to survive, you must also support reaching an agreement with the Palestinians to share the land which both peoples claim. There is no other future for the Jewish state that I can imagine. As a Zionist, I therefore support genuine peace and reconciliation between the two peoples — and a two-state solution to bring an end to the conflict. 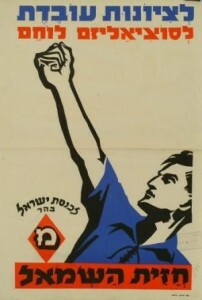 I am happy to embrace the label “socialist Zionist” and the tradition that represents — the kibbutz movement which for decades was a model democratic socialist society, the struggle by left Zionists including a party I was proud to be a member of (Mapam) against racism and for peace, against religious coercion and for social justice for Jews and Arabs. I could, I guess, go along with Freedland and just call myself “a socialist who supports the right of the Jewish people to their own country” — but why not just embrace the label of “Zionist” instead? This article appears in the latest issue of Solidarity. 4 Comments on "Proud to be a Zionist"
As one Socialist Zionist to another, an excellent article. We are in a struggle here in Israel and around the world between right-wing religious and secular people who are trying to hijack the term Zionism, and those of us on the left who consider settler, expansionist Zionism to be post-or even anti-Zionism. Historical Zionism is the national liberation movement of the Jewish people, an expression of the Jewish right to national self-determination, which in no way contradicts the equal Palestinian right to national self-determination. That’s what the two state solution is all about. You don’t need to convince committed Zionists. Arguments that may be convincing to you, don’t necessarily carry weight with those of other faiths and backgrounds. You aren’t going to convince members of the Aryan Nation or the Hamas either, so there is no point arguing directly with them.